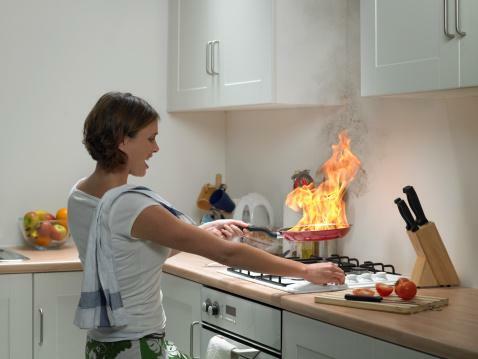 Kitchen safety awareness is crucial during food preparation and cooking, as well as during clean-up and daily living. 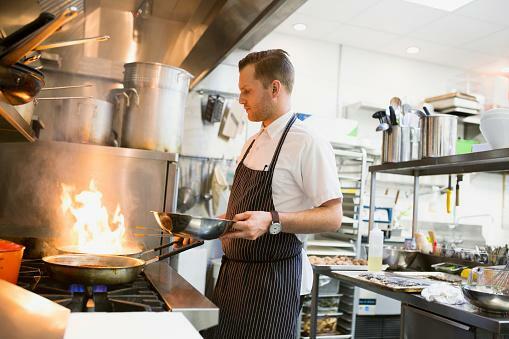 Understanding the hazards present in the kitchen can help you avoid causing an accident or subjecting your family to a bout of food poisoning. In order to stay safe in the kitchen, it's important to understand the dangers present in this area of your home. From sharp knives to hot stoves, reading up on kitchen hazards can help you change your habits and protect your family. Always handle knives with caution. When picking up a knife, make sure you aren't holding anything else or are distracted. Keep your knives sharpened so you don't need to strain while chopping, slicing, or dicing. When chopping round objects, cut one side to make it flat and then lay the flat side down on your chopping block. This way, you can stabilize whatever item you are chopping. Grasp the knife handle firmly and lay your other hand on top of the knife to prevent any blade contact. Use tongs to handle large, firm products. When handling hot items, grasp them firmly and be mindful of oil or water splashing. Use tools with hand grips if you have difficulty with firmly grasping your cooking tools. When using tools that have sharp edges for the first time, go slowly until you get the hang of it. Graters, zesters and mandolins all have the potential to slice or cut your fingers or hands if you aren't paying attention, or misuse them. Keep utensils clean to prevent food contamination. When hand drying or putting sharp utensils away, watch where you place your hands. Use a pot pan or pour baking soda over the flames to smother grease fires. Water will not work and should not be used. For microwave, stove, or oven fires, shut the door and turn the appliance off. If it is safe, unplug the appliance and if the fire continues for several minutes, call the fire department. With electrical fires, do not use water to extinguish them. It's best to use a fire extinguisher. Keep a small one in your kitchen if possible. In general, always watch food that's on the stove, avoid wearing loose clothing that could catch fire, and double check that you've turned appliances off when you are done using them. If the child has long hair, have them tie it back to prevent it from catching on fire or blocking their view. Teach them about washing their hands before beginning and after handling raw foods. 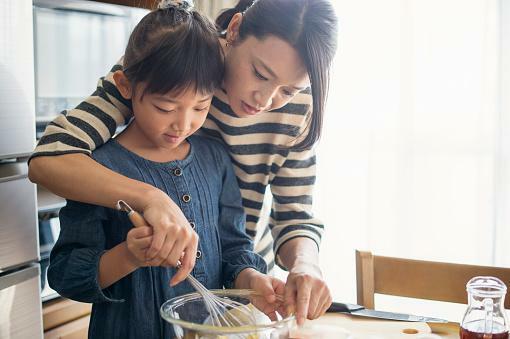 When using sharp or dangerous objects like food processors or blenders make sure to monitor the child at all times and inform them what is and isn't okay to do. When cooking with pots and pans, teach your child to turn the handles away from them so they don't accidentally knock them over. If your child is quite young, don't let them use knives, the blender, the stove, or anything else that could potentially cause an injury. With older kids, teach them how to use cooking utensils properly, as well as general safety and how to put out a fire if an emergency occurs. In addition to the hazards from heat and sharp objects, the kitchen also presents safety concerns surrounding food preparation. Improper food preparation can lead to food poisoning like salmonella. Keep these tips in mind to prepare food safely for yourself and your family. Heat oil slowly to avoid splashing, which can lead to minor burns. When putting your food into the pot or pan, do so slowly so the oil doesn't splash. Watch food that's on the stove or in the oven to prevent burning. If you smell something burning, turn the heat off and wait a few minutes before checking the food in case a small fire has started. Before cleaning your pot or pan, let them cool completely and remember to use pot holders to prevent your hands from getting burned. Extra virgin olive oil has a low smoking point so be cautious when heating this up and do so very slowly. You can also consider using coconut oil, grapeseed oil, and ghee when you are cooking at higher temperatures. Don't buy any food that is past the expiration date. Shop for your perishable foods last. Do not buy meat in a torn or leaking package. When buying meat, place it in an extra bag before putting it in your cart. Do not buy dented or damaged cans. Refrigerate food within one to two hours, depending on room temperature. Keep your refrigerator temperature below 40 degrees Fahrenheit and the freezer below zero. Wrap meat securely so it will not leak on other food and store it on a bottom shelf so it doesn't drip on other foods. Use canned foods before the expiration dates. For home-canned food, the National Center for Home Food Preservation recommends using items within one year. Always wash your hands well with soap and water before you begin preparing a meal. Over the course of the day, your hands come in contact with a variety of bacteria and viruses that can cause illness. Thoroughly washing your hands reduces your risk of spreading these diseases. The freezer is a great way to preserve meat until you're ready to use it, but it's essential that you use the proper procedures to thaw meat safely. Otherwise, you put your family at risk for food poisoning. 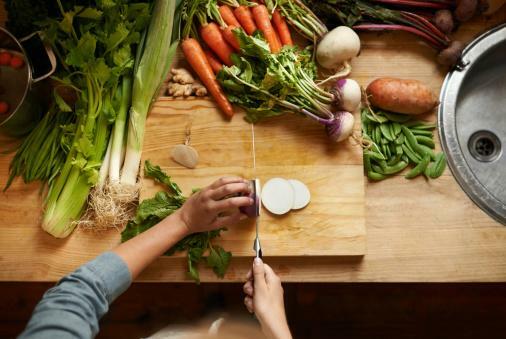 Use separate, clean cutting boards for each type of food. Be sure to use plastic cutting boards that you can sanitize in the dishwasher and that are in good condition. Sanitize other food surfaces after cutting up meat or fish. Use a weak bleach solution on countertops. Wash your hands thoroughly after cutting meat. Never return cooked food to the same plate you used for raw food. Although a chicken breast or other dish may appear "done," it isn't always safe to eat. Testing the internal temperature of the item is a better way to check whether it's safe to consume. 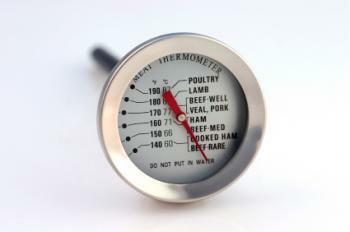 To use a food thermometer, insert the sharp end into the thickest portion of the meat without touching the bottom of the pan or the bones. Wait for the thermometer to give you a reading. If you have to take food from one place to another, using coolers and thermoses will help keep foods at safe temperatures. Using a cooler properly is important. Fill a cooler or ice chest with ice or ice packs to maintain a cold environment. Pack food tightly, and as soon as you arrive at your destination, place it in a refrigerator or on ice. This is important for uncooked as well as cooked meats. Having a clean kitchen is an essential part of having a safe kitchen. This means using proper procedures to sanitize surfaces and take care of spills. Wash all your countertops and tables with hot soapy water immediately before and after use. If you're cutting up meat or using eggs, sterilize the surfaces with a weak solution of bleach and water. The kitchen sink can be a dangerous place when it comes to food-borne pathogens. Rinsing chicken breasts, scraping dirty dishes, and other tasks can deposit bacteria on this surface. When you rinse vegetables, wash dishes, or drain pasta, you can inadvertently contaminate "clean" foods and surfaces with the dirty sink water. Regularly use a cleanser with bleach to kill harmful germs. Your cooking and prep utensils also need to be thoroughly cleaned. Immediately wash knives in hot, soapy water and dry thoroughly. Don't use wooden utensils for meat dishes, since it can harm these items to go in the dishwasher. When in doubt, soak utensils in a bleach water solution to rid them of pathogens. Although they aren't a "green" choice, paper towels are safer for drying your hands and cleaning up spills. Dish towels can easily become contaminated with germs. When that happens, it's too easy to spread those germs to other surfaces. Germs can live in damp sponges and dishcloths, so it's important to clean or replace these items on a regular basis. For dishcloths, wash them in your washing machine using hot water. 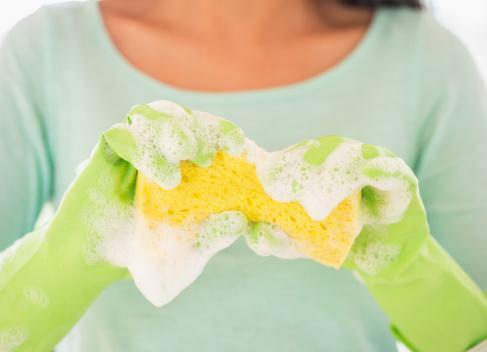 According to tests conducted by Good Housekeeping, soaking sponges in bleach water was the most effective way to clean them. 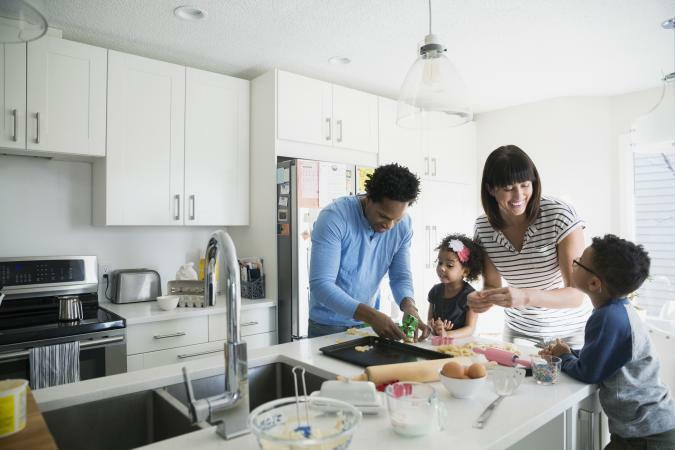 Being aware of kitchen hazards and taking care with your food handling and cleaning can help keep you and your family safe from accidents and food poisoning. Although these measures may seem time-consuming, they can prevent illness and accidents and put your mind at ease.